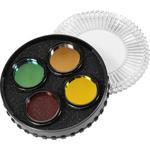 The abbreviation L-RGB stands for Luminance, Red, Green and Blue. 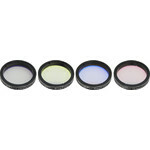 These filters are specially designed for astrophotography use. 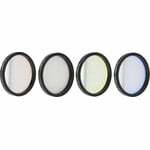 For creating a colour image with a black-and-white camera, an exposure is made through each filter. These are then combined on the computer to form a coloured combined image. The inclusion of the L-filter increases the contrast. Using a colour camera eliminates the need for such filter sets, but only a black-and-white camera can take full advantage of the chip's resolution and also allows the use of line filters.